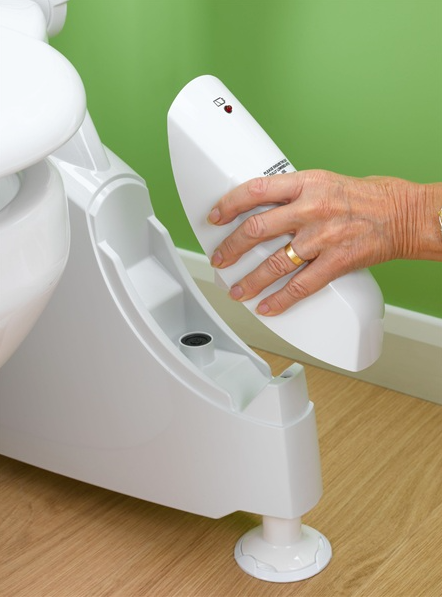 The Solo Battery Powered Toilet Lift Easy To Install. There is no need to give up on the idea of using the toilet independently, just because you struggle to get onto and off a standard toilet. With the Solo Toilet Lift, the battery-powered lift does all the work for you. All you need to do is remove your own toilet seat, place the toilet lift over the bowl, and it’s ready. 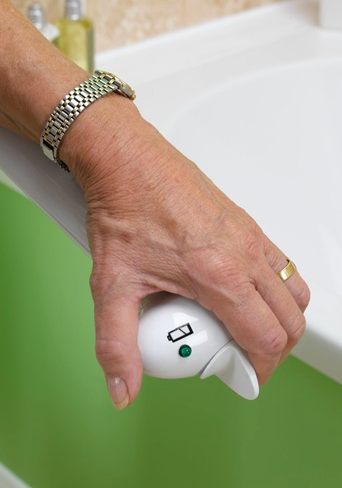 Battery-powered device that enables users with restricted mobility to get on and off toilet at the touch of a button. Ideal for individuals who have difficulty performing sit-to-stand activities due to muscle or joint weakness in their legs and/or upper body e.g. due to multiple sclerosis, osteo- or rheumatoid arthritis, hip replacement, heart problems and obesity. 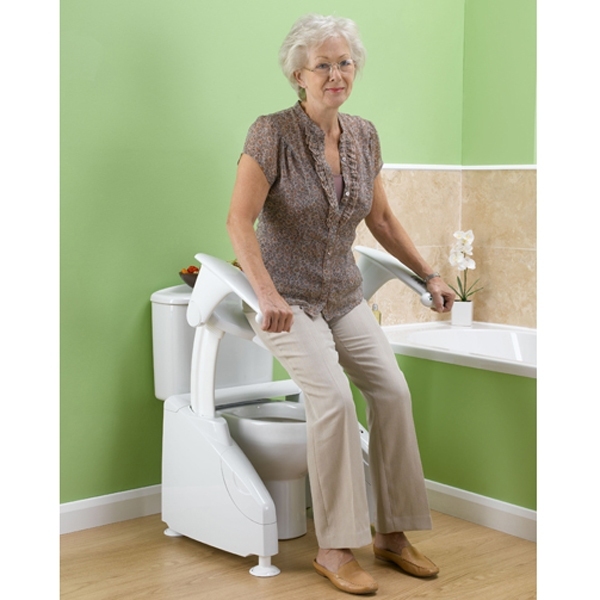 Helps reduce manual handling risks for carers who provide toileting assistance. Powered lifting action replicates body’s natural standing movement. Seat can be stopped at any position to suit user comfort and support requirements. 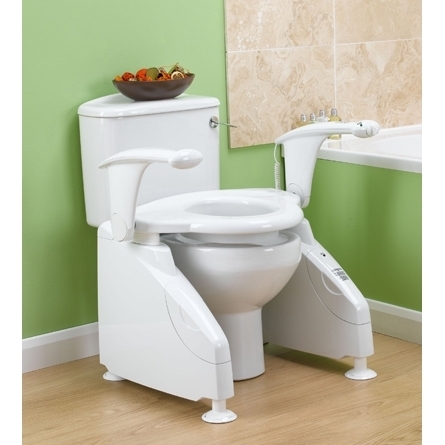 Fits easily and compactly over existing toilet, blending discreetly into modern home. Smooth, wipe-clean surfaces for ease of cleaning. Acts as a normal toilet seat in lowered position for use by other household members. No specialist installation - simply remove existing toilet seat and place over toilet bowl. 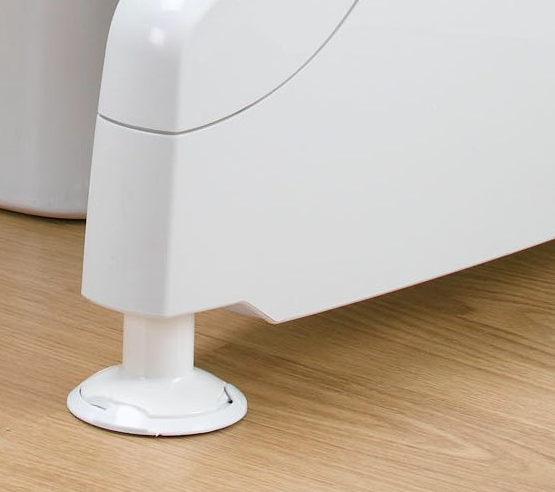 Feet rotate clockwise and anti-clockwise to adjust height for different users/toilets. Models also available with tilt-up armrests (with/without integral operating controls), which give additional user support. Supplied with two rechargeable batteries to ensure continuous operation. Battery level indicator monitors when recharging is required.